Profile:Creating the Dell Medical School at The University of Texas at Austin is the equivalent of starting a new campus. Stage A: Site Development. Outside Plant (OSP) pathways, connectivity, emergency call stations, and exterior wireless overlays for the district. Stage B: Research Building. This 240,205-GSF building will house 60 Principal Investigator groups and include wet/dry labs, physical labs, a vivarium, core research and imaging centers, collaboration spaces. The firm is consulting on all technology disciplines. Stage C: Medical Office Building. IT and Security consultation and design for the 260,143-GSF medical office building, which will include space for medical imaging, diagnostic treatment, ambulatory surgery, meeting rooms and physicians' offices. Stage D: Education Building. 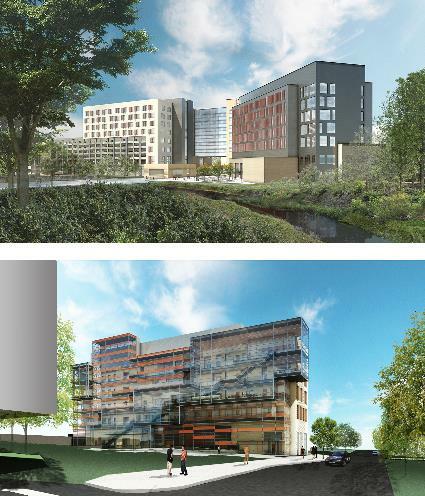 The 75,000 GSF epicenter of the medical educational program will include educational and study spaces, a library, and the administrative offices of the medical school. Technology in the building will enable video-capture and streaming of lectures, virtual reality teaching computer stations, lab equipment, and patient simulation mannequins. Consulting on all technology disciplines. Stage E: Parking Garage. Information Technology and Electronic Security/Access Control consultation and design for the 1,120-space parking facility adjacent to the Medical Office Building. Material Transfer Center: Serving both the Medical District and new Engineering School in support of Environmental Health and Safety campus operations. IT consulting and design. Chilling Station 7: IT and Security for a 15,000-ton chilled water and 36,000-ton thermal energy storage facility.